Luxurious home on 1.5 scenic acres in the popular Churchill Estates community. This spacious, open concept home offers almost 5,600 square feet of total living space. Double French doors open to the foyer with 18’ ceiling and designer chandelier. A formal dining room boasts striking walnut and Brazilian hardwood flooring and classic crown moulding. Turreted style windows allow plenty of natural light into the main floor den. The hub of the home is the impressive great room with 18’ ceiling open to the second level landing above. A gas fireplace with full height stone surround adds a rustic feel to this otherwise polished space. The great room flows into the gourmet eat-in kitchen with custom cabinetry. Under-cabinet lighting highlights the granite countertops and intricate stone tile backsplash. High-end stainless steel appliances and a pantry with built-in storage add to the functionality of the space, while the two-tiered central island with bar seating is the perfect spot to entertain. A sunny breakfast area with panoramic windows walks out to the covered outdoor patio. The attached three-car garage with separate entrance to the lower level is easily accessible through a mud/laundry room with charming bench seating and coat hooks. A powder room is quietly tucked away, with a gorgeous antique-style vanity sure to impress any guest. The main floor master retreat is your private oasis, with windows overlooking the lush rear yard and pond with waterfall feature. Your own private walkout to the covered outdoor patio is perfect for warm summer nights. A three-sided gas fireplace delineates the bedroom from the spa-like ensuite with travertine marble flooring and wainscoting, His & Her vanity, separate soaker tub, and seamless glass shower with glass subway tile inlays and rain and hand-held showerheads. A full dressing room provides ample storage. Upstairs, three additional good-sized bedrooms are serviced by a five-piece bathroom with separate water closet. 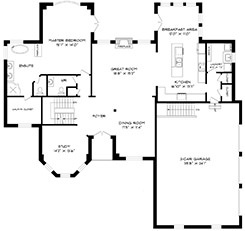 The fully finished lower level offers tons of space to play games, watch movies, or exercise. A fifth bedroom makes an ideal guest, nanny, or in-law suite, with access to a three-piece bathroom with heated flooring. The scenic 1.5 acre lot is dressed with professional landscaping and hardscaping, with interlock pathways and a variety of mature trees and cedars for maximum privacy year round. A stone BBQ alcove and fire pit framed by ornamental grasses set the scene for the perfect summer party, while the irrigation system makes for hassle-free maintenance. Just minutes from amenities and major commuter highways, this is the perfect home for anyone seeking tranquility without sacrificing luxury!